Don't forget hwy 53 between Temple and Hearne. There is a fair amount of traffic using that route to get to Bryan or points south bypassing Cameron and Milano. It's about time. Runs from US 190 Business east of Copperas to I-35. Wikipedia was pretty quick to update it. Runs from US 190 Business east of Copperas to I-35. Well, the nose is (officially) through the door. It'll be interesting to see how the rest of the I-14 "body" actually ends up fitting into the TX (and possibly beyond) overall scheme -- and how it fits into other plans. Particularly of interest is the Junction to Eden "connector" along US 83; that has the potential to serve as an alternative Port-to-Plains-related (I-27?) alignment if actually "adopted" as part of the I-14 cluster; some posters have suggested a scenario similar to this. Also, the same map that indicated that connector also showed the toll facility that extends north from Austin parallel to US 183 as veering slightly east of that route toward Copperas Cove and Fort Hood rather than maintaining the 183 trajectory toward Lampasas. The question would be whether anyone a bit closer to Austin-area planning efforts have more information about that possible connector? If so, please chime in! Frankly, this segment looks like a I-781: Just a highway to appease a military installation. In the case of the original freeway, which dates back to the '80's, likely so. The western extensions look like simply a case of a series of facilities intended to address new regional housing developments (this is one of the faster growing metro areas in TX). The I-14 concept came later as a cross-state connector; the existing freeway was merely a convenient place to "stake a claim", so to speak. We'll all just have to see what comes of this whole plan down the line. I still believe this I-14 road will likely be a travesty and boondoggle if it sticks with the very crooked, zig zag routing of US-190 through Central Texas. Lots of extra miles, lots of extra drive time and lots of extra wasted money. If TX DOT really wants to do this, they need to make I-14 go around the South side of Temple, to Cameron then directly to College Station and Huntsville. Adding angles to include Hearne and Madisonville is just plain stupid. I have a hard time believing this road would ever extend past Huntsville at best. Building it out to Alexandria and Natchez are extreme long shots. Same thing goes for the western extensions as far as Midland. Particularly of interest is the Junction to Eden "connector" along US 83; that has the potential to serve as an alternative Port-to-Plains-related (I-27?) alignment if actually "adopted" as part of the I-14 cluster; some posters have suggested a scenario similar to this. I'd suggested more of a direct route for I-27 from San Angelo to Junction on an entirely new terrain path. Taking the road to Eden adds a bunch of miles. It's almost as bad as sending I-27 directly South from San Angelo to meet I-10 at Sonora, and presumably go to the border at Del Rio and even possibly meet an extended I-2 there. Given how the new administration feels about Mexico I can imagine a lot of potential funding being denied for South Texas road projects, at least anything that helps traffic move more easily across the border. If the ultimate concept of I-14 is to consolidate the TX/LA corridors with the proposed "14th Amendment Highway" in MS/AL/GA, than it's less of a long shot. Have LA, MS, AL and GA actually shown any interest in I-14? Texas seems to be the only state jumping for it. I-73 was supposed to have run from South Carolina to Michigan and yet North Carolina is the only state that has actually built any of it. It makes me wonder if I-14 would run into a similar situation where Texas would be the only state to show any real interest and build it. I-14 would've been better suited for connecting Houston to Austin, and then back to I-10 in west Texas, IMO, since it would give Austin an interstate connection to the East and West coasts. The currently designated section of I-14 could've easily became an I-x35. IMO, the likely near-to-middling-term scenario is this: as the interests in W. Texas and the "Triangle" seem to be driving this corridor, it'll start out in Midland/Odessa, extend through San Angelo, Brady, Temple, and Bryan/State College -- and likely end there for the time being, transferring the bulk of its traffic to TX 249 toward Houston. The "piney woods" segment into LA will remain on the table, so to speak, but unconstructed. Some sort of connector to Austin will be made, whether it be via Lampasas or the Fort Hood area. Whether another "mirror" Austin connector to the NE (via US 79? ), hinted at in the planning maps, remains to be seen. LA is having enough trouble with I-49, and I-69 is a mere zygote within the state at this point; putting a mid-state E-W corridor on their plate seems unlikely in the near term. Our 12-year-old poster is likely the only one of us who has a chance of seeing I-14 as a Texas-South Carolina corridor in their lifetime! Well...the original plan for the "14th Amendment Highway" was to run from Natchez to Augusta, but since there's no Interstate highway going through Natchez, it was extended to end at I-49 in Alexandria. Plus, it was given the "I-14" designation. Even the association pitching the current I-14 route combines the two into one multistate corridor. A connection from Austin to Houston via either US 290 or TX 71 makes perfect sense as an Interstate corridor, but probably not as I-14. I'd prefer that to be a western I-12, or just leave it as is. Also, wasn't a "TTC-14" corridor using the current I-14 proposal among the initial Trans Texas Corridor proposals as a bypass of I-10 through Austin/Houston/Beaumont?? It could had been worse, someone could had pushed to get I-99 in TX. Sorry I couldn't resist. Well, it looks like we are going to have to accept the newly designated Interstate 14 as it is. Surely they will come up with something to satisfy the need for an interstate-standard Houston-Austin corridor. I could be wrong, but I'm not sure if a western I-12 would be a good idea, as I think it might cause confusion due to being in such close proximity to the existing, eastern Interstate 12. I still think that corridor would work well as I-14, but it doesn't sound like it will turn out that way at all. With that said, I would suggest possibly an I-210 designation for the Houston-Austin corridor that would connect to I-10 again on the west side of Austin and San Antonio. Sure, it would be one hell of a long 3di, but we're running out of 2-digit options. Once again, I could be wrong - a western I-12 may not cause confusion at all, and if so, I'd be open to that idea, too. 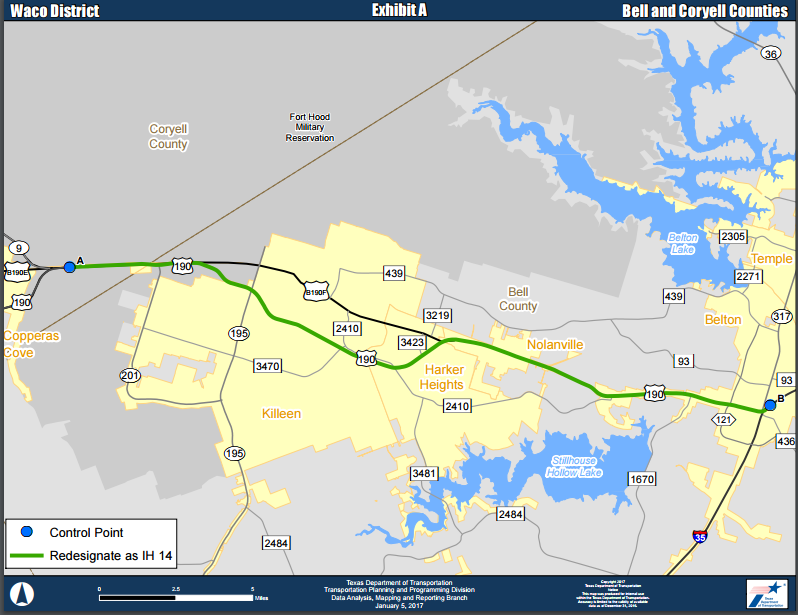 It sounds like the new Interstate 14 corridor is set in stone as it is, with the section from Belton to Copperas Cove being the first of it. I'm still excited about this, I just think that things could have been done a little better. With this meaning my proposed I-18 probably would not end up working out in Texas, this frees up an Interstate 18 designation for something like a Columbus-Macon-Augusta corridor in Georgia, of which this specific section of the proposed I-14 corridor would be a little more in the grid as an I-18 corridor, since much of it would run north of I-16 in Georgia. However it is routed, I hope to see I-14 come to fruition in its entirety within my lifetime. Politicians can spam the idea all they want. Actually paying for it and building it is an entirely different matter. There are numerous highway projects of much greater importance in Texas and Louisiana that need to be completed well ahead of this I-14 nonsense. Mississippi is too broke to fund their portion of I-69 and The Great River Bridge. They're having a hard enough time just trying to bring US-78 up to Interstate standards to sign it as I-22. This I-14 deal would be a much more costly project than any of those existing needs. Alabama has long wanted an Interstate going West out of Montgomery to meet up with I-20 at the MS border. That span could just as easily be numbered as an extension of I-85 as any number of other concepts that have been floated through the years, like an I-16 extension or this I-14 idea. But, again, where is the funding coming from to built this? Georgia has plenty of its own upgrade needs for existing highways, particularly in the metro Atlanta area. Overall, this I-14 project looks like a giant, un-funded mandate. The route will be so crooked, if ever completed, that it won't draw very much traffic at all off the I-20 and I-10 corridors. Houston to Austin is a far more legitimate corridor to target with an Interstate highway upgrade. I guess now it will have to be another I-12 rather than I-14. Surely they will come up with something to satisfy the need for an interstate-standard Houston-Austin corridor. I could be wrong, but I'm not sure if a western I-12 would be a good idea, as I think it might cause confusion due to being in such close proximity to the existing, eastern Interstate 12. I don't see any problem with calling a Houston-Austin Interstate I-12. The Interstate system already has numerous duplicate 2di routes (I-74, I-76, I-84, I-88), disconnected 2di routes (I-49, I-69) and other additional duplicate routes that may be added to the system (I-66, I-87). I think the Houston-Austin route is too long to carry a 3-digit designation. That corridor could easily be expanded both East (to Beaumont) and West (to the US-290/I-10 interchange in West Texas). The only alternative I see to "I-12" is a letter suffix route, like "I-10N." That would open a whole can of worms on how to treat the existing I-10 route. In the past certain Interstates like I-5, I-15, I-70 and I-80 had suffixed routes while they kept their parent number from being suffixed. With hwy 71 out of Austin being upgraded to interstate status by the airport, Austin will have its interstate quality connection to Houston. And no I do not expect I-14 to follow the crooked 190 routing to Bryan. Are there any I-14 signs up yet? I don't understand why this wasn't just signed as I-335. It's also difficult to imagine traffic counts that justify a third E-W interstate in Texas west of US 377 and US 183. US-290 between Houston and Austin is in far greater need of being upgraded to Interstate standards than TX-71. There is considerably more traffic and towns along that route. US-290 comes into the Austin area closer to where a great deal of growth is taking place (Round Rock, Georgetown, Hutto, etc.). It's also a more direct route from Houston, especially for the more affluent areas on the North side of the Houston metro area. What ever Interstate designation that could be applied to US-290 between Houston and Austin could be moved over to the Grand Parkway and a possible extension to Beaumont. As gigantic as the metro areas are of both Houston and Austin (6 million and 2 million respectively) I think a good case could be made for upgrading both those stretches of US-290 and TX-71 to Interstate quality. Both roads already have a number of freeway quality or near freeway quality bypasses around a number of towns. Either of those routes is easier to justify upgrading than the I-14 route being proposed. This is a politically motivated route, not one to actually improve the functions of the Interstate highway system. In trying to make as many political advocates happy, I do expect I-14 to ping pong itself through Central Texas in a crooked, saw tooth pattern. I'm all for making I-14 go directly from Temple to Byran, with the route skirting Cameron and then having the road go directly to Huntsville. But that's not how any of the I-14 maps look. They're not going to leave out anyone on the US-190 corridor. So, from Cameron, the road will turn at Milano and needlessly go up to Hearne and then down to Bryan. From Bryan the road will illogically go up to Madisonville and then multiplex with I-45 down to Huntsville. That kind of routing is just stupid. But all of the I-14 campaign maps show that route. Hell, looking at how crooked I-69 is shaping up to be, among other strangely crooked freeway projects, I-14 through Central Texas could end up being even more crooked! It's Midland/Odessa & San Angelo politics that's driving the western extension, not current AADT data. The only part of stand-alone US 190 between Temple & Bryan that's likely to actually be used as an I-14 alignment is the segment between Temple and Cameron. East of there I'd fully expect a relatively straight shot east to TX 6 between Bryan & Hearne, crossing the Brazos River floodplain near (or at) US 79/190 east of Gause, where the river has been effectively channelized to accommodate the highway & RR bridges. Now, if the corridor ever extends east of College Station, I'd expect to see a really crooked profile in order to avoid the various lakes and wooded thickets en route to Louisiana (both extensive grubbing and multilane bridges tend to make construction costs soar!). The only part of stand-alone US 190 between Temple & Bryan that's likely to actually be used as an I-14 alignment is the segment between Temple and Cameron. East of there I'd fully expect a relatively straight shot east to TX 6 between Bryan & Hearne, crossing the Brazos River floodplain near (or at) US 79/190 east of Gause, where the river has been effectively channelized to accommodate the highway & RR bridges. Building I-14 between Temple and Bryan in as direct a path as possible is exactly what TX DOT should do, even if it means building a whole lot of new terrain roadway. Unfortunately, as I have repeated so many times in the past, this is a political road. A direct I-14 path can be diverted by lots of promises to many communities and interests along the US-190 corridor. I can imagine interests in Hearne crying foul if I-14 goes directly from the Cameron area to Bryan. That all depends on I-14 trying to have a more direct path. For all we know the political interests driving I-14 could force this road to leave the TX-6 corridor on the North side of Bryan and parallel US-190 Northwest to Madisonville (which would be very stupid and wasteful). I would prefer I-14 follow TX-6 through College Station and then spur off near Texas World Speedway toward Roans Prairie where it can then parallel TX-30 to Huntsville. Building I-14 East of Huntsville will be politically complicated and possibly very costly. Lake Livingston is a tricky hurdle. The planning maps show the route using US-190. I would assume I-14 would re-use the US-190 crossing over Lake Livingston. But then there's the town of Onalaska right in the way. To me it looks like I-14 would have to be built North of that development on new terrain and new bridges over the lake and its river feeders. Alexandria would love to have an east-west Interstate to etch its status as the Crossroads of Central Louisiana even further into stone. One could argue that there is value in having an east-west corridor further inland in case something were to happen to the I-10/12 corridor (hurricane, rise in sea level, whatever). One could probably argue that there is national-defense value in a highway directly from Fort Hood to the Mississippi River via Fort Polk. If we can get stuff made in Mexico instead of China, Texas becomes supreme in distribution of consume goods across the country. The more routes from Texas to the population centers of the States, the better. Louisiana would show interest in I-14 for the same reason it would show interest in I-69: having cross-country routes pass through your state is good for business and tourism. Have LA, MS, AL and GA actually shown any interest in I-14? Texas seems to be the only state jumping for it. In the aftermath of Hurricane Katrina back in 2005-06, the concept of I-14 (along US 84) as a E-W cross-connector for the various N-S Gulf Coast evacuation routes, including being the location of emergency refugee/evacuation centers -- far enough inland to avoid the brunt of onshore storms but closer than I-20 -- was for a short time advanced; but that was short-lived, with more attention paid to the development of I-49 South as an alternative evacuation route. Ten years later, I for one haven't heard word one from any quarter about I-14 serving that particular purpose despite its recent resurgence. Since the US 79 and UPRR bridges, where crossing the Brazos is most favorable in terms of construction ease, are only a few miles west of Hearne, it's likely that a relatively direct route will merge with TX 6 only a few miles south of that town as well -- essentially forming a bypass directly SW of the town. That should satisfy Hearne interests; plowing up town-center businesses or disrupting the industrial areas arrayed along the 3 railroad lines converging on the town (Hearne has always been a major rail junction, originally with Missouri Pacific and Southern Pacific lines; both are now UP properties) wouldn't be considered a "best interest" scenario -- a bypass skirting the edge of town should more than suffice.